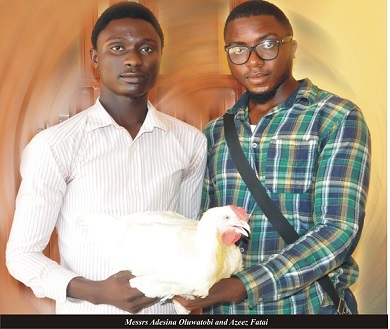 In a bid to develop their entrepreneurial skills and to make an impact in the agricultural sector of the nation, students of the University have engaged in the rearing of poultry birds for commercial purposes. Operating under the auspices of the Nigeria Animal Science Students Association (NASA), FUNAAB Chapter, Messrs Adesina Oluwatobi John of the Department of Animal Physiology and Azeez Fatai Adeniyi of the Department of Animal Production and Health, College of Animal Science and Livestock Production (COLANIM), disclosed that they embarked on the exercise to keep themselves busy following the protracted strike by the Academic Staff Union of Universities, as well as to generate income for themselves. 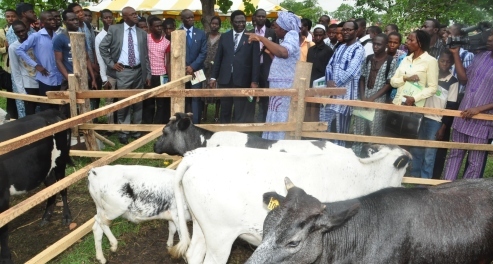 Oluwatobi said they made use of the NASA farm structure at COLANIM to raise the birds, mainly broilers, from day old to maturity from their personal savings and the assistance they got from some agro-allied industries. They expressed appreciation to the University for the opportunity and the enabling environment in realising their desire.